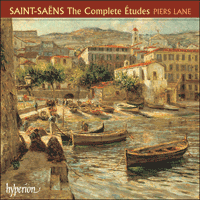 It is a bit of a mystery why Saint-Saëns's enjoyable Études are not better known. Perhaps it is their extreme awkwardness which deters pianists—these works are prime examples of a peculiarly French school of finger technique which requires absolute independence and equality for each digit, making no concession whatsoever to the weaker fingers or the shape of the hand. The Opp 52 and 111 sets of Études each end with a barn-storming show-stopper, 'En forme de Valse' and 'Toccata d'après le 5e Concerto' respectively. The left-hand Études are perhaps less demanding, but nonetheless require a particular clarity and precision, being in essence a pastiche Baroque suite. The Thème Varié, fundamentally a compendium of pianistic challenges, was written as a test piece for the Paris Conservatoire. It was Christmas Eve, 1921, and no ordinary funeral. The famous old organist, Charles Widor, was addressing a huge congregation in the Madeleine in Paris. Charles Camille Saint-Saëns had died eight days before in the Hôtel de l’Oasis in Algiers. He had been the organist at the Madeleine from 1857 to 1876 and so it was fitting that his state funeral should be staged there. A massive procession accompanied him to his final resting place in the Montparnasse cemetery. Saint-Saëns had returned to Paris once and for all. He had been born there in the Rue du Jardinet in the Latin Quarter eighty-six years before. His ancestors had hailed from the village of St Saëns near Lyon, where the somewhat obscure St Sidonius Apollinaris had lived a happy life with his wife and family, writing, hunting and fishing. The Saint-Saëns family obviously did not receive the blessings of St Sidonius in full measure! Just three months after Camille was born, his father, an audit clerk at the Ministry of the Interior, died at the age of thirty-seven from tuberculosis. He had married Clémence only the year before. She was a carpenter’s daughter, but artistically talented and she got on well with her musical aunt, Charlotte Masson. The baby was delicate and tubercular, and it was feared he would not live long. Charlotte moved in to help Clémence—and never moved out again! When Camille was two-and-a-half years old, Charlotte inducted him into the mysteries of her own instrument, the piano. He was an above-average student for his age and, within a year, penned a little piano piece whose autograph is now retained in the Bibliothèque Nationale! Perhaps his perfect pitch helped! At around the age of five he made a successful public debut accompanying a Beethoven violin sonata, receiving critical approbation in the Moniteur Universel. At the same age, he fell in love with Mozart’s Don Giovanni and was given a copy as a sort of talisman. He was by then, of course, a dab hand at composing himself, though his own hands were too small to realize his galops and waltzes at the keyboard. A case of a willing spirit, but weak flesh! Not for long, though. Great-aunt Charlotte realized her limitations, and his, and enrolled him at the age of seven for lessons with Camille-Marie Stamaty (1811–1870). Stamaty was a musical grandson of Joseph Haydn. The link was Friedrich Kalkbrenner (1785–1849), a great pianist and an inventive teacher. His method involved a device suitably called a guide-mains (‘guide for the hands’). Stamaty continued the use of Kalkbrenner’s implement with his own students. When the American prodigy Louis Moreau Gottschalk went to study with him in Paris, the thirteen-year-old was a little dismayed that he had to relearn his technique—but he took heart from observing the seven-year-old Camille Saint-Saëns utilize the hand guide ‘as if he were amusing himself with a game’. Much later, Saint-Saëns described the hand guide: ‘It was a bar fixed in front of the keyboard, upon which the forearm rested, in such a fashion as to get rid of all muscular tension except that of the hand itself. This system is excellent for forming the young pianist in the execution of works written for the clavecin and for the earliest pianofortes, of which the notes spoke without effort on the player’s part, though insufficient for modern works and instruments. It is thus, however, that we should begin developing first firmness of touch and finger, and suppleness of wrist, and adding progressively the weight of the forearm and that of the arm. It was not only strength of finger that one acquired by this method, but also the production of tone-quality by the finger only …’ Stamaty left a set of exercises called Le rythme des doigts. The metronome is used while applying various rhythms to fairly overtly unmusical phrases, in order to develop strong, independent fingers and a still hand-position. Stamaty’s influence was strong: through Saint-Saëns and other students like Marie Pleyel (1811–1875) his approach inflected French playing for many decades. The young Camille was an avid student and began his second decade auspiciously with a formal debut at the Salle Pleyel on 6 May 1846. He played Mozart’s Concerto in B flat major, K450, naturally writing his own cadenza! This was followed by some solo offerings: a Handel theme with variations and fugue, a toccata by Kalkbrenner, a Hummel sonata, and a Bach prelude and fugue. To round things up nicely, he finished with Beethoven’s Concerto No 3 in C minor. The audience was thrilled by his playing and by his memory. To ensure they got their money’s worth, Camille gave them a choice of encore—any of the thirty-two Beethoven sonatas! Reports of this concert circulated far and wide. Camille was saluted as a second Wolfgang Amadeus. Saint-Saëns entered the Paris Conservatoire as he entered his teens. His professors included François Benoist for organ and, from 1850, Halévy for composi­tion. He obtained the Second Organ Prize in 1849 and a brillant Premier Prix in 1851. Whilst a student there, he met the renowned singer Pauline Viardot, who included Saint-Saëns in her famous Thursday evening soirées. He left his student days behind him in 1852, but competed for two composition prizes. Like Ravel after him, he failed to win the Prix de Rome with his entry in both 1852 and again twelve years later in 1864. He did, though, gain first prize in a competition organised by the Paris Société Saint-Cécile for his Ode à Sainte-Cécile. Through the founder of the society, the Belgian violinist François Seghers, he met Liszt, who became a firm friend. The Society was also responsible for performing his first official symphony (published as No 1 in E flat in 1855) under the baton of Seghers. What fun this occasion must have been! To ensure an objective appraisal, three stars appeared in the printed programme instead of the composer’s name. Great was the post-symphony applause and great was the astonishment when the composer was revealed as an eighteen-year-old Frenchman. Older colleagues were impressed—Gounod foresaw a great future for him; Rossini often included him in his soirées; and Berlioz admired his gifts, though with amusing acuity quipped: “He knows everything but lacks inexperience.” The gist of this criticism was to typify appraisal of Saint-Saëns for his whole career—an ace mind and technical facility supressing emotional depths and heights, perhaps in the interests of a pure and ascetic aesthetic. Claudio Arrau once described the veteran Saint-Saëns’ piano-playing (which he heard when he was in his twenties): “… the most even scales you can imagine, and great power in the fingers. Ice cold, but amazing.” His career proceeded in several directions at once. Organ-playing provided a crescendo of income and prestigious appointments—for a few months in 1853 he was organist at the church of St Séverin; for a few years until 1857 he held the post at St Merry—and then he performed improvisatory miracles at the Madeleine for nearly two decades. His congregations there included visiting colleagues like Robert Franz, Anton Rubinstein, Sarasate (only fifteen when he commissioned a concerto from Saint-Saëns, who was greatly flattered), Clara Schumann, and Franz Liszt who declared Saint-Saëns the ‘king of organists’ and ‘foremost among French composers’ when writing to a friend in 1866. To be closer to the Madeleine, the two Saint-Saëns (mother and son) plus great-aunt Charlotte, moved to new lodgings on the Rue Faubourg St Honoré. Monday nights at their home were dedicated to soirées for musicians, following the Thursday tradition at the Viardots’. Saint-Saëns, the prodigy, was still at it, impressing everybody with his glorious gifts. The sixties must have been a satisfying time for him. He was famous to the point where cartoonists caricatured his bird-like walk and beak-like nose, his lisp and his diminutive height. Composing came as easily ‘as an apple tree producing apples’. He was still spoilt rotten by the two maternal women in his life. However, the climate of things began to change. His friend Berlioz died in 1869, and in the same year he had to temporarily abandon work on his opera Samson et Dalila because of cool resistance from Paris Opera directors. Fifteen years later, this work had a major success under Liszt’s sponsorship in Weimar. Only then was Paris interested in it. But Germany reacted unfavourably to Saint-Saëns’ performance of his own first piano concerto and other pieces in 1869—critics talked of his ability ‘to dazzle but not to inspire’. In 1870 Saint-Saëns became a soldier in the Fourth Battalion of the Garde Nationale de la Seine. The Franco-Prussian War had begun on 19 July that year. It was all over by 28 January 1871, but cultural mindsets had been permanently altered. Saint-Saëns’ response was positive—to co-found and become vice-president of the Société Nationale de Musique. The aim was to promote ‘Ars Gallica’—the performance of new music by French composers. Members included the likes of Gabriel Fauré, César Franck, Édouard Lalo, Henri Duparc and Alexis de Castillon. Immediate performances were impossible—the Commune was proclaimed on 18 March and the ensuing unrest, bloodshed and arrests in Paris prevented an easy flow of artistic life. Towards the end of that year, though, the Society began fufilling its praiseworthy intentions—and subsquently premiered works by Saint-Saëns and its other original members, as well as those by Chabrier, Debussy, Ravel and Dukas, despite Saint-Saëns’ eventual and articulate disapproval of modern trends as time went on and the strong influence of German (particularly Wagnerian) aesthetics on Chabrier, Lalo, Franck, D’Indy, Duparc and Chausson. In the early 1890s Erik Satie was to urge fellow French composers to aspire to music ‘without Sauerkraut’. But that’s jumping the gun. 1872 occasioned the heartbreaking loss of Great Aunt Charlotte at the venerable age of ninety-one. Saint-Saëns cancelled everything for two months. His first opera La Princesse jaune was a flop at the Opéra-Comique. However, the next year, the Cello Concerto, Op 33, achieved public success, as did the Variations sur un thème de Beethoven pour deux pianos. The Danse Macabre was premiered too—and was the work which elevated Saint-Saëns to world fame. It was the first serious piece to employ a xylophone, greatly disturbing for its original audience! One critic said the piece had ‘everything but a musical idea, good or bad … it can only be defined in two ways: as an aberration or as a hoax’. The various strains of this period taxed Saint-Saëns’ vulnerable health. He retreated to Algiers for two months of late autumn sunshine. This was the first of many such visits. 1875 was a watershed year for him. He married! This was seemingly out of the blue. The bride, Marie-Laure, was the nineteen-year-old sister of his school friend Jean Truffot. She was not musical. His mother disapproved and the whole thing proved a disaster. They wed, very discreetly, far from Paris—but they moved in again with Mme Saint-Saëns senior, no doubt a redoubtable mother-in-law! Two sons were born (in 1875 and 1877), but both suffered tragic deaths. André, the elder, at two-and-a-half, leaned too far over their fourth-storey apartment balcony. The distraught Marie-Laure retreated with the seven-month-old Jean-François to her own mother’s home in an attempt to recover. Within six weeks her second child succumbed to pneumonia and passed away. Saint-Saëns could never forgive her and, three years later, abandoned her while on holiday. They were legally separated and never saw each other again, though she lived near Bordeaux until the staggering date of 1950. Many commentators suspect the discreet Saint-Saëns of homosexual preferences and interpret his numerous North African visits as quests for intimacy. Saint-Saëns may even have been a source for Proust’s pivotal character, Baron Charlus, in À la Recherche du temps perdu. Proust was a fan, praising the purity, grace and sobriety of Saint-Saëns’ playing. In 1876 Saint-Saëns added a debut as music critic to his curriculum vitae, writing for a succession of magazines and papers. He also undertook a complete edition of Gluck’s works. His music was now more highly thought of by his public than ever before. He was in such demand by 1877 that he was able to give up his Madeleine position. This was the year he composed his first volume of Études for piano, Op 52. Invisibly, though, a divisive movement was beginning its subtle development. Saint-Saëns the critic wrote objective reviews of the Bayreuth premiere of ‘The Ring’ in 1876. He later commented: “I deeply admire the works of Richard Wagner, despite their bizarre qualities. They are stunning and powerful, and that is enough for me. But I never was, I am not now, I never will be a Wagnerian fanatic.” However, a press campaign was fought against the ‘Wagnerian Saint-Saëns’ in early 1877. Nine years later, Germany was cancelling Saint-Saëns’ engagements after finding his comments on the Paris production of Lohengrin offensive and hateful of Germany. He had to endure weak applause and expressions of disapproval from his Berlin public. Upset, he retired for a time to a small Austrian village where he composed Le Carnaval des animaux which, excluding ‘The Swan’, he banned from publication in his lifetime. He feared its light-hearted jesting would usurp the position his serious works warranted, undermining their stature. How right he was! Even the popular Third Symphony, written the same year and dedicated to his late friend Franz Liszt, does not share quite the limelight of Carnaval, despite Saint-Saëns saying “I gave everything to it I was able to give”. The Symphony was commissioned by the Philharmonic Society in England and Saint-Saëns conducted its first performance in London. He was always welcomed warmly in England; he played to Queen Victoria and enjoyed studying the Handel manuscripts in Buckingham Palace. But 1886 was also the year Vincent d’Indy managed to oust Saint-Saëns from his own Société Nationale. An unfortunate rift had opened up between the Saint-Saëns school and that of César Franck. The more Wagnerian D’Indy-Franck side wanted to promote more foreign music than Saint-Saëns would have wished. Saint-Saëns’ world almost came to an end in 1888 when he lost the person closest to him in life—his dear mother. He considered suicide but, after a retreat to Algiers, decided—momentously—to change his life radically. He wanted to go far away and become ‘a different self’. His cousin Léon in Dieppe must have wondered what hit him! Saint-Saëns’ complete household goods, including his art collection, library, manuscripts and furniture, arrived on the doorstep. A Saint-Saëns museum opened in Dieppe in July 1890! Saint-Saëns himself, using the name Monsieur Charles Sannois, fled to Las Palmas in the Canary Islands. Gossip had him in a mental institution or lost at sea. His nomadic existence became a way of life for the next fourteen years. His manservant, Gabriel Geslin, and his dogs (one called Dalila) were his loyal companions in exile. His destinations were frequently exotic—Ceylon, Cairo and Alexandria, Saigon, Italy, Spain, Portugal, Greece, Scandinavia, Brazil, Argentina and Uruguay (for which he wrote a national anthem). Despite a new musical spirit pervading Paris in the form of Franck’s pupils and the young Claude Debussy, Saint-Saëns did have several triumphs in the early nineties. In November 1892, Samson et Dalila was finally seen in Paris and its composer feted. 1893 saw him in Cambridge where he was ‘Doctored’ along with Bruch, Tchaikovsky and an absent Grieg. Here he performed his new piano-and-orchestra work, Africa. The premiere of Piano Concerto No 5 in F major, Op 103, was given on 6 May 1896 in a festival to celebrate the fiftieth anniversary of his childhood debut. Nicknamed ‘The Egyptian’, it was lauded by the press. Saint-Saëns had been inspired by a Nubian love song he had heard boatmen sing as he floated down the Nile on a dahabiah. In 1899, Déjanire had its spectacular premiere at Béziers’ outdoor arena. It was not a modest event—120 strings, 18 harps and 25 trumpets! Before leaving again for the Canary Islands after the death of his librettist Gallet, Saint-Saëns completed his Op 111 Études. The new century inundated him with honours on the one hand and disappointing criticism on the other. In 1901 the opera Les Barbares (the tenth of thirteen) provoked Debussy’s question: “Is there no one who values Saint-Saëns enough to tell him that he has now written enough operas?” Debussy had mixed feelings about Saint-Saëns. Once he remarked, “I have a horror of sentimentality and I cannot forget its name is Saint-Saëns!” But on another occasion he said: “To say I’m a passionate admirer of Saint-Saëns’ music would be going too far. But you have to admit it’s damned cleverly put together.” In turn, Saint-Saëns continued to lambast Debussy, unable to comprehend the younger man’s compositional procedures and dissonant results. Some years later he even admitted to Pierre Lalo: “I am staying in town to speak ill of Pelléas.” It is ironic that one of Debussy’s tasks as a young man was to transcribe Saint-Saëns’ work for the publisher Durand. Impressionism, though, did begin to taint Saint-Saëns’ own style—witness the Fantaisie for violin and harp written in Cairo in 1907 when he was recovering from diphtheria. The previous year, at the age of seventy-one, he had made a successful American debut and the following year he was to make yet another career move. He became the first film composer for Henri Lavedan’s silent movie about the historic assassination of the Duc de Guise. In 1910 Saint-Saëns thrilled springtime London with a complete cycle of the Mozart concertos: afterwards, he moved into his final Paris apartment and re-wrote Déjanire. There were several unusually topical works in these years: he composed a hymn to electricity in 1900 (La feu céleste); To Airmen in 1911, soon after Blériot did his cross-Channel flight; To the Miners in 1912; and A Workers’ Hymn in 1914. 1911 was a fallow year for inspiration: “La lyre est désaccordée” (“The lyre is out of tune”) said Saint-Saëns. In January 1912, though, his piano-duet partner, Caroline de Serres, requested a cycle of left-hand Études (Op 135). They were completed in Cairo by 29 February. In 1913 there were some important occasions. On 2 April, he, Debussy, D’Indy, Fauré and Dukas participated in the inaugural concert of the Théâtre des Champs-Elysées in Paris. 29 May was another memorable night at that theatre—perhaps the most memorable in its history. Stravinsky’s Rite of Spring was premiered to shocked audience protest. Saint-Saëns was horrified by it and walked out—not surprisingly, perhaps, for someone who had been born just eight years after Beethoven’s death! London was the place to be on 2 June—a Queen’s Hall celebration for Saint-Saëns’ seventy-fifth anniversary as a concert pianist. Invitations subsquently flooded in for European concerts, which he accepted with undiminished alacrity. The advent of the 1914–1918 War slightly stymied proceedings. Saint-Saëns’ patriotism unfortunately found expression in a series of rather nasty articles called Germanophilie, attacking Wagner particularly, but also politicizing his music in a way that alienated not only his German readers but his French ones as well. His spleen vented, he became France’s ambassador to San Francisco’s World Fair in 1915, with his new cantata Hail California. Various small pieces occupied him until he completed his Second String Quartet in 1918, and a massive Fantaisie for organ and orchestra, Cyprès et Lauriers, Op 156, celebrating France’s victory and the end of the war. Three woodwind sonatas followed, and a work for flute and chamber orchestra, Odelette. He was tireless to the end, but finally gave in to pneumonia. Fittingly, he left Paris and journeyed to Algiers twelve days before his peaceful death … the nomad off on his travels again. His was a life filled with interest and excitement, but one cannot help feeling that the insistent business masked a desperate loneliness and that further isolation must have been the result of endless acerbic attacks on colleagues, and even friends. His was an aesthetic largely out of tune with the times he lived in, but his prodigious talent was one of the greatest of all time. Saint-Saëns’ eighteen Études are not easy to play! One of his first biographers, Georges Servières, describes the Opus 52 studies as ‘less difficult that Liszt’s, less varied than Chopin’s and less refined than those of Stephen Heller’. One wonders if M Servières played them! Certainly they are less varied than Chopin’s, but the difficulties, often exacerbated by their prolonged repetition, are quite as tricky as anything in Liszt’s. Liszt’s and Chopin’s études, though, are undoubtedly the progenitors of Saint-Saëns’, despite the latter’s different aesthetic. In his memoirs, École buissonnière, Saint-Saëns wrote: ‘Music is something besides a source of sensuous pleasure and keen emotion, and this resource, precious as it is, is only a chance corner in the wide realm of musical art. He who does not get absolute pleasure from a simple series of well-constructed chords, beautiful only in their arrangement, is not really fond of music.’ Like the Parnassian poets he believed in ‘Art for Art’s sake’ and that ‘in Art, a difficulty overcome is a thing of beauty’. A certain detachment is therefore a consideration when approaching the Études, though, of course, neither are they to be treated merely as artful exercises. There are concert works to be found among them, and students will find many attractive alternatives to the usual prescribed fare. Opus 52 begins in grand improvisatory style, with a debt to Liszt’s Preludio from the Études d’exécution transcendente. No 1, Prélude, perhaps also owes something to Saint-Saëns the organist, with its toccata spirit. Its bravura arpeggios and alternating chords range confidently across most of the keyboard and lead to a più mosso double-note experience in nasty-minded positions! Joseffy has nothing on this—nor does the Liszt Preludio! A final run in double thirds completes the fun, and the cadential chords leave no doubt about the key of the piece—C major, like Liszt’s piece and Chopin’s Étude Op 10 No 1. The third of the set is the Prélude et Fugue in F minor, slightly reminiscent of Mendelssohn’s preludes and fugues, and encouraging a non-legato touch. The Prélude is fiendishly difficult and toccata-like in its groups of repeated thirds, alternating between the hands. Saint-Saëns had a personal knack for this sort of thing and used it in other places as well—for example, the two piano Variations on a Theme of Beethoven, Op 35. The Fugue is three-voiced with a fairly chromatic subject which achieves its climax in leaping octaves. Then to the relative major key for the fourth piece, Étude de rythme, which prettily and persistently explores a two-against-three rhythm, either in the one hand, or between the two. No 5 is another Prélude et Fugue, with related themes in A major. Accompanying double-note tremolos suggest a vaguely impressionistic blur in the Prélude and recall the double-notes of the first étude. This is far more graceful in intent, though, and leads to a slightly academic four-voice Fugue. What a brilliant contrast, therefore, to the ensuing étude, En forme de Valse, one of the delights of the French repertoire and a favourite in the concert hall. This piece calls for the jeu perlé style of playing at which Saint-Saëns so excelled—characterized by glittering precision, with fast, clear, shallow-keyed articulation and a suave elegance. It is charming and pianistically mischievous, with its runs in thirds, sixths and octaves and its caricature of the salon showpiece. Opus 111 was written twenty-two years later in 1899. As with Opus 52, each étude is dedicated to a well-known virtuoso; again there is an emphasis on double-note technique. I have a great affection for the first piece, Tierces majeures et mineures dedicated to Arthur de Greef. It pays homage to Chopin’s infamous Op 25 No 6, sharing the ghoulish key of G sharp minor and recalling the opening trill figure. To make things difficult, though, it calls for the right-hand thumb to hold down notes, forcing the use of the fingers for the thirds. It also requires left-hand participation in thirds, unlike the Chopin. Technical requirements aside, it has a touching plaintiveness quite alien to the opening étude of Op 52. A winged poetry permeates the five-finger chromatic figures of No 2, Traits chromatiques. Surely Debussy had this étude somewhere in his subconscious when he wrote his étude, Pour les degrés chromatiques? A rather more angular Prélude et Fugue in E flat minor displaces the impressionistic world of the first two études. Shifting quaver chords agitate a courageous, thrusting theme in the prelude, which eventually quietens into a thoughtful fugue subject, taken up in four voices and rounded off by a big finish. The seductive world of the Canary Islands is conjured up by No 4, Les cloches de Las Palmas. Repetition and the creation of atmosphere are the technical exercises involved—a rather imaginative tone poem is the result. No 5, Tierces majeures chromatiques, again delights in the difficulty of thirds—this time major chromatic thirds. A sense of humour inflects its moto perpetuo feel. It is dedicated to Édouard Risler, probably the first truly great French-trained pianist, after Saint-Saëns himself, and a major artistic influence on Alfred Cortot. As with Opus 52, the best piece is sensibly saved for last. The Toccata d’après le 5e Concerto is dedicated to Raoul Pugno, renowned for his brilliant deftness. Its themes, as the title suggests, are from Saint-Saëns’ Piano Concerto No 5 (the third movement), composed three years before this étude. It pre-dates the toccatas of Debussy, Ravel and Prokofiev and has comical references to ragtime, which, in those years, was traversing the Atlantic to fervent European welcome. Octaves, left-hand leaps and arpeggiated chords are despatched with authentic pianistic imagination. It is a tour de force and deserving of a wider audience. The left-hand Op 135 Études are distinctive and in a world removed from the other two sets. Caroline de Serres née Montigny-Rémaury was Saint-Saëns’ duet partner and the dedicatee of his ‘waltz-caprice’ Wedding Cake, Op 76, a gift for her second wedding in 1886. In 1912 her right hand was operated on and she requested a set of studies for her left hand alone. Robert Casadesus, in conversation with Dean Elder, tells a different story. He was under the impression that Saint-Saëns had written the Études for the best students of his good friend Louis Diémer, the dedicatee of Franck’s Variations symphoniques. Because Casadesus was the teacher’s pet (chou chou), Diémer gave him the Bourrée, considered the best piece of the set. He played it for Saint-Saëns himself. One wonders how Saint-Saëns reacted! That grande-dame of French playing, Jeanne-Marie Darré, who played all five Saint-Saëns Concertos in one evening in 1926, described Saint-Saëns as “very boorish, you know, not amiable”. For Opus 135 Saint-Saëns becomes neo-Classical, recreating old dance forms from harpsichord suites, inspired by his life­long interest in the works of Couperin and Rameau. These are unpretentious pieces, but beautifully textured and intelligently designed. They were avidly studied by Ravel before he wrote his Concerto pour la main gauche. The Thème Varié, Op 97 (1894), is included on this CD because it was written as a species of étude—it was composed as a test piece for a competition. It was dedicated to Ambroise Thomas, director of the Conservatoire and, incidently, brother-in-law of Caroline de Serres. After a brilliant introduction, a chorale theme is explored in five fairly free variations; the piece ends much as the CD began—hammering home C major chords! Les dix-huit Études de Saint-Saëns ne sont pas faciles à jouer! L’un de ses premiers biographes, Georges Servières, décrit les études op. 52 de la manière suivante: «Moins difficiles que celles de Liszt, moins variées que celles de Chopin et moins raffinées que celles de Stephen Heller». On se demande si M. Servières les a lui-même effectivement interprétées! Il est vrai que les Études de Saint-Saëns sont moins variées que celles de Chopin, mais leur difficulté, souvent exacerbée par des répétitions prolongées, égale bien celles que l’on peut trouver chez Liszt. Les études de Liszt et de Chopin se trouvent cependant et sans aucun doute à l’origine de celles de Saint-Saëns, ceci en dépit de l’esthétique différente de ce dernier. «La musique est plus qu’une source de plaisir sensuel et d’émotion intense, et ce plaisir, aussi précieux soit-il, n’a qu’une importance très relative au vaste royaume de l’art musical. Celui qui ne retire pas un plaisir absolu d’une simple série d’accords bien construits, admirables ne serait-ce que dans leur arrangement, n’aime pas vraiment la musique», écrit Saint-Saëns dans ses mémoires, École buissonnière. Comme les poètes parnassiens, il croyait en «l’art pour l’art», et que «en Art, une difficulté surmontée est objet de beauté». Il convient donc d’adopter un certain détachement en abordant les Études, même si bien sûr celles-ci ne constituent pas pour autant de simples exercices de virtuosité. Certaines d’entre elles se prêtent tout à fait à une interprétation en salle de concert, et les étudiants en musique y trouveront de nombreuses et séduisantes alternatives à leur menu quotidien. L’opus 52 commence par une improvisation au style majestueux, inspirée du Preludio des Études d’exécution transcendante de Liszt. Cette première pièce, Prélude, doit peut être ses allures de toccata à Saint-Saëns l’organiste. Ses arpèges vifs et ses accords en alternance couvrent avec aisance la majeure partie du clavier, et font vivre à l’interprète une expérience mémorable de jeu en double notes più mosso! Joseffy ne connaissait rien de cela, et quant au Preludio de Liszt … Un passage final rapide en doubles tierces termine le tout en beauté, et les accords cadentiels ne laissent aucun doute quant à la tonalité de la pièce: do majeur, comme le Preludio de Liszt et l’Étude no1, op. 10 de Chopin. La troisième pièce, Prélude et Fugue, en fa mineur, rappelle vaguement les préludes et fugues de Mendelssohn et appelle une exécution non liée. Le Prélude est extrêmement difficile à interpréter et ses groupes de tierces répétées à mains alternées l’apparentent à une toccata. Saint-Saëns avait une prédilection pour ce genre de subtilités, que l’on retrouve ailleurs dans son œuvre, par exemple dans les Variations pour deux pianos autour d’un thème de Beethoven, op. 35. La Fugue est à trois voix; son sujet, chromatique en grande partie, atteint son apogée par octaves. On passe ensuite à la quatrième pièce, Étude de rythme, en relatif majeur, qui exploite de manière plaisante et avec persistance une mesure à trois-deux et se joue en alternance d’une main et des deux. La cinquième pièce est un autre Prélude et Fugue, avec des thèmes proches, en la majeur. Dans le Prélude, des trémolos en double notes produisent un flou vaguement impressionniste et rappellent les double notes de la première étude. Ce prélude est cependant d’intention beaucoup plus gracieuse et débouche sur une Fugue à quatre voix certes un peu académique. L’étude suivante, En forme de Valse, joyau du répertoire français et souvent donnée en concert, offre un contraste étonnant. Cette pièce fait appel au jeu perlé dans lequel excellait Saint-Saëns. Il est caractérisé par une précision scintillante, un doigté rapide et léger et une élégance douce. Il s’agit d’une pièce charmante et pleine de malice pianistique, caricature des pièces de salon avec ses roulades en tierces, sixtes et octaves. L’opus 111 date de 1899, vingt-deux ans après l’op. 52. Comme dans celui-ci, chaque étude est dédiée à un virtuose réputé; on retrouve le même enthousiasme pour la technique de la double note. J’ai beaucoup d’affection pour la première pièce, Tierces majeures et mineures, dédiée à Arthur de Greef. Elle rend hommage au célèbre op. 25 no6 de Chopin, dont elle partage la tonalité quelque peu macabre en sol dièse mineur et rappelle le trille d’ouverture. La difficulté qu’elle présente, cependant, tient en ce que le pouce droit se doit de tenir les notes, obligeant ainsi les autres doigts à exécuter les tierces. Elle nécessite également une participation de la main gauche aux tierces, ce qui la distingue de la pièce de Chopin. Exigences techniques mises à part, son ton plaintif et émouvant la distingue nettement de l’étude d’ouverture de l’op. 52. Les figures chromatiques à cinq doigts de la pièce no2, les Traits chromatiques, sont empreintes d’une poésie légère. Debussy s’en inspira certainement, au moins inconsciemment, lorsqu’il composa son étude pour les degrés chromatiques. Un Prélude et Fugue en mi bémol mineur, plus anguleux, disperse l’univers impressionniste des deux premières études. Des accords en croches agitato soutiennent le thème hardi et audacieux du Prélude, qui s’apaise progressivement pour laisser place à un sujet de Fugue mélancolique à quatre voix, parachevé par un grand finale. Les cloches de Las Palmas (no4) évoque l’univers séduisant des Îles Canaries. Les exercices tech­niques exigés par le morceau—répétition et jeu atmosphérique—débouchent sur une pièce caractéristique plutôt original. La pièce no5, Tierces majeures chromatiques, est elle aussi admirable pour la difficulté de ses tierces—il s’agit cette fois de tierces chromatiques majeures. L’impression de moto perpetuo qu’elle dégage lui confère une tournure plutôt humoristique. Elle est dédiée à Édouard Risler, influence artistique majeure d’Alfred Cortot, et probablement après Saint-Saëns le premier grand pianiste formé en France. Comme dans l’opus 52, on garde le meilleur pour la fin. La Toccata d’après le 5ème Concerto est dédiée à Raoul Pugno, renommé pour son extrême virtuosité. Les thèmes de la pièce, comme le suggère son titre, s’inspirent du troisième mouvement du concerto pour piano de Saint-Saëns, composé trois ans auparavant. Elle annonce les toccatas de Debussy, Ravel et Prokofiev, et fait référence de manière spirituelle au ragtime, qui à l’époque venait de traverser l’Atlantique et recevait en Europe un accueil fervent. Octaves, sauts de la main gauche et accords arpégés se mêlent avec une imagination toute pianistique. Il s’agit d’un tour de force, qui mériterait d’être mieux connu. Les Études pour la main gauche, op. 135, se distinguent très nettement des deux précédents opus. Caroline de Serres (née Montigny-Rémaury) était la partenaire de duo de Saint-Saëns, et la dédicataire de sa «valse-caprice» Pièce montée, op. 76, écrite en guise de cadeau pour son second mariage, en 1886. Elle subit en 1912 une opération de la main droite et demanda de ce fait à Saint-Saëns de composer une suite d’études destinées à être jouées uniquement de la main gauche. Robert Casadesus, dans un entretien avec Dean Elder, donne une autre version des faits. Il déclare que Saint-Saëns composa les Études pour les étudiants les plus brillants de son grand ami Louis Diémer, dédicataire des Variations Symphoniques de Franck. Casadesus étant le «chouchou» de Diémer, celui-ci lui réserva la Bourrée, qui est généralement considérée comme la meilleure pièce de l’ensemble. Il l’interpréta devant Saint-Saëns en personne. Dans l’op. 135 Saint-Saëns se fait néo-classique et recrée d’anciennes danses du répertoire de suites pour clavecin—on se souvient de l’intérêt qu’il manifesta toute sa vie pour les travaux de Couperin et de Rameau. Il s’agit de pièces sans prétention, mais de texture élégante et de conception intelligente. Ravel les étudia avec avidité avant de composer son Concerto pour la main gauche. Ce CD contient un enregistrement du Thème Varié, op. 97, de 1894 car celui-ci fut composé à titre de morceau imposé pour une compétition. Il est dédié à Ambroise Thomas, directeur du Conservatoire, et, accessoirement, beau-frère de Caroline de Serres. Après une introduction spectaculaire, un thème choral donne lieu à cinq variations d’esprit assez libre, et termine ce CD comme celui-ci avait commencé—par un martèlement d’accords en do majeur! Saint-Saëns’ achtzehn Études sind nicht leicht zu spielen! Georges Servières, einer seiner ersten Biographen, schreibt über die Etüden op. 52, sie seien „weniger schwierig als die von Liszt, weniger mannigfaltig als die von Chopin und weniger kultiviert als die von Stephen Heller“. Man fragt sich, ob M. Servières sie je gespielt hat. Gewiß sind sie weniger mannigfaltig als die von Chopin, aber die Schwierigkeiten, oft noch verstärkt durch ausgedehnte Wiederholung, sind durchaus so vertrackt wie alles, was Liszt geschaffen hat. Fest steht, daß Liszts und Chopins Études Vorläufer derer von Saint-Saëns sind, obwohl der sich einer anderen Ästhetik befleißigte. In École buissonnière, seinen Memoiren, schrieb Saint-Saëns: „Musik ist mehr als eine Quelle sinnlicher Wonne und heftiger Gefühle, und dieser Schatz, so kostbar er sein mag, ist nur ein zufälliger Winkel im gewaltigen Reich der musikalischen Kunst. Wem eine schlichte, gut aufgebaute Akkordfolge, die durch nichts anderes als ihre Anordnung besticht, kein absolutes Vergnügen bereitet, ist kein wirklicher Musikliebhaber.“ Wie die parnassischen Dichter glaube er an die „Kunst um der Kunst willen“ und daran, daß „in der Kunst eine überwundene Schwierigkeit ein Quell der Schönheit“ sei. Eine gewisse Distanz ist darum zu erwägen, wenn man an die Études herangeht, obwohl sie natürlich auch nicht als bloße kunstvolle Übungen behandelt werden dürfen. Es sind konzertante Werke darunter, und Klavierschüler werden viele ansprechende Alternativen zur sonst verordneten Kost finden. Opus 52 beginnt im großen improvisatorischen Stil mit einer Anspielung auf Liszts Präludium zu den Études d’exécution transcendente. Die Nr. 1 mit dem Titel Prélude ist mit ihrem Toccata-Temperament wohl obendrein dem Organisten Saint-Saëns verpflichtet. Ihre bravourösen Arpeggien und alternierenden Akkorde nehmen selbstbewußt fast die ganze Klaviatur in Anspruch und führen zu einem più mosso überschriebenen Erlebnis mit doppelten Noten in gemeinen Positionen! Das vermag selbst Raffael Joseffy nicht zu übertreffen—und das Lisztsche Präludium auch nicht! Ein abschließender Lauf aus doppelten Terzen macht den Spaß komplett, und die kadenzierenden Akkorde hinterlassen keinen Zweifel bezüglich der Tonart des Stücks—C-Dur wie das von Liszt und wie Chopins Étude op. 10 Nr. 1. An dritter Stelle in der Sammlung steht das Prélude et fugue in f-Moll, das ein wenig an Mendelssohns Präludien und Fugen erinnert und einen nicht legato gehaltenen Anschlag fördert. Das Prélude ist höllisch schwierig und erinnert mit seinen Gruppen wiederholter Terzen, die zwischen den Händen hin- und herwechseln, an eine Toccata. Saint-Saëns hatte eine persönliche Vorliebe für dergleichen und hat es noch anderswo eingesetzt—zum Beispiel in den zwei Klaviervariationen über ein Thema von Beethoven (op. 35). Die Fuge ist dreistimmig mit einem recht chromatischen Subjekt, das seinen Höhepunkt in Oktavsprüngen erreicht. Dann geht es zur parallelen Durtonart für das vierte Stück, die Étude de rythme, die hübsch beharrlich einen Zweiertakt gegen einen Dreiertakt ausspielt, mal in der einen Hand, mal zwischen beiden. Die Nr. 5 ist wieder ein Prélude et Fugue mit verwandten Themen in A-Dur. Begleitende Doppelnotentremoli hinterlassen im Prélude einen vage impressionistischen Eindruck und erinnern an die Doppelnoten der ersten Etüde. Die vorliegende ist jedoch von der Intention her erheblich würdevoller und geht in eine eher akademisch konventionelle vierstimmige Fuge über. Welch ein brillanter Kontrast ergibt sich dadurch zur folgenden Etüde mit dem Titel En forme de Valse, die ein Leckerbissen des französischen Repertoires und ein Favorit im Konzertsaal ist. Dieses Stück verlangt nach der jeu perlé genannten Spielweise, die Saint-Saëns so gut beherrschte—gekennzeichnet durch funkelnde Präzision mit schneller, klarer, flach angeschlagener Artikulation und einer verbindlich wirkenden Eleganz. Es ist charmant mit seinen Läufen aus Terzen, Sexten und Oktaven und mit seiner Karikatur eines meisterlichen Salonstücks pianistisch mutwillig. Opus 111 entstand 1899, zweiundzwanzig Jahre später. Wie bei Opus 52 ist jede Étude einem bekannten Virtuosen gewidmet; wieder liegt die Betonung auf dem Spiel mit doppelten Noten. Ich empfinde große Zuneigung für Tierces majeures et mineures, das Arthur de Greef gewidmete erste Stück. Es huldigt Chopins berüchtigter Etüde op. 25 Nr. 6, hat ebenfalls die makabre Tonart gis-Moll und ruft die einleitende Trillerfigur ins Gedächtnis. Um die Sache noch schwieriger zu machen, verlangt es jedoch, daß der Daumen der rechten Hand einzelne Töne aushält, und erzwingt so den Einsatz der übrigen Finger für die Terzen. Außerdem wird anders als in der Chopin-Etüde auch die linke Hand zum Spielen von Terzen eingespannt. Von den technischen Anforderungen abgesehen ist das Stück von einer rührenden Schwermut, die der ersten Étude von Opus 52 völlig fremd ist. Eine beschwingte Poesie druchdringt die fünffingrigen chromatischen Figuren der Nr. 2, Traits chromatiques. Gewiß hatte Debussy diese Etüde irgendwo im Unterbewußtsein gespeichert, als er seine Étude pour les degrés chromatiques schrieb? Ein erheblich kantigeres Präludium und Fuge in es-Moll verdrängt die impressionistische Welt der ersten beiden Etüden. Sich verlagernde Achtelakkorde regen im Präludium ein beherztes, schwungvolles Thema an, schließlich ruhiger werdend in ein nachdenkliches Fugensubjekt verwandelt, das von vier Stimmen aufgegriffen und mit einem großen Finale abgerundet wird. Die reizvolle Welt der kanarischen Inseln wird von der Nr. 4 mit dem Titel Les cloches de Las Palmas heraufbeschworen. Wiederholung und das Schaffen von Atmosphäre sind die technischen Übungen, um die es geht—ein recht einfallsreiches Tongedicht ist das Ergebnis. Tierces majeures chromatiques, die Nr. 5, ergötzt sich wiederum an der Schwierigkeit von Terzen—diesmal sind es chromatische große Terzen. Ihre Moto-perpetuo-Stimmung ist mit Humor befrachtet. Das Stück ist Édouard Risler gewidmet, dem wohl ersten wahrhaft großen in Frankreich ausgebildeten Pianisten nach Saint-Saëns, der einen wesentlichen künstlerischen Einfluß auf Alfred Cortot ausgeübt hat. Wie bei Opus 52 wird das beste Stück vernünftigerweise bis zum Schluß aufgespart. Die Toccata d’après le 5e Concerto ist Raoul Pugno gewidmet, der für seine besondere Gewandtheit berühmt war. Ihre Themen stammen wie im Titel angedeutet aus dem dritten Satz des drei Jahre vor dieser Etüde komponierten Klavierkonzerts von Saint-Saëns. Sie ist vor den Toccaten von Debussy, Ravel und Prokofjew entstanden und enthält launige Anspielungen auf den Ragtime, der damals über den Atlantik kommend in Europa begeistert willkommen geheißen wurde. Oktaven, Intervallsprünge der linken Hand und arpeggierte Akkorde werden mit wahrem pianistischem Einfallsreichtum eingesetzt. Das Stück ist eine Glanzleistung und hat es verdient, einem breiteren Publikum nahegebracht zu werden. Das Thème varié op. 97 (1894) ist auf dieser CD vertreten, weil es als eine Art Etüde—als Probestück für einen Wettbewerb—komponiert wurde. Es ist Ambroise Thomas gewidmet, dem Direktor des Conservatoire, der zufällig auch der Schwager von Caroline de Serres war. Im Anschluß an eine brillante Einleitung wird in fünf relativ freien Variationen ein Choralthema erkundet, und das Ende fällt im Großen und Ganzen so aus, wie die CD beginnt—mit gehämmerten C-Dur-Akkorden!